In this issue of the JCI, Asosingh et al. establish a central role for allergen-sensing hematopoietic progenitors and endothelial cells in the pathogenesis of asthma, reporting that the allergen-stimulated cells are sufficient to induce angiogenic remodeling, inflammation, and airway hyperreactivity in the lung endothelium. The cover image visualizes disruption of the murine airway endothelial barrier following exposure to house dust mite allergen. Dark-stained areas indicate where the endothelial barrier is breached by protease allergens. Citation Information: J Clin Invest. 2018;128(7):2743-2745. https://doi.org/10.1172/JCI121053. Citation Information: J Clin Invest. 2018;128(7):2746-2749. https://doi.org/10.1172/JCI121525. The discovery of HLA-B*57:01–associated abacavir hypersensitivity is a translational success story that eliminated adverse reactions to abacavir through pretreatment screening and defined a mechanistic model of an altered peptide repertoire. 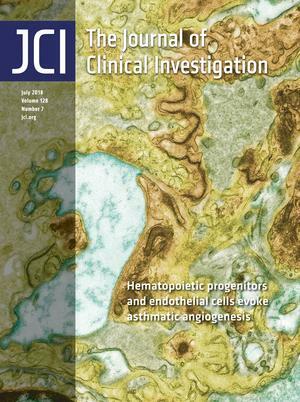 In this issue of the JCI, Cardone et al. have developed an HLA-B*57:01–transgenic mouse model and demonstrated that CD4+ T cells play a key role in mediating tolerance to the dramatically altered endogenous peptide repertoire induced by abacavir and postulate a known mechanism by which CD4+ T cells suppress DC maturation. This report potentially explains why 45% of HLA-B*57:01 carriers tolerate abacavir and provides a framework for future studies of HLA-restricted, T cell–mediated drug tolerance and hypersensitivity. Citation Information: J Clin Invest. 2018;128(7):2750-2753. https://doi.org/10.1172/JCI121527. Citation Information: J Clin Invest. 2018;128(7):2754-2756. https://doi.org/10.1172/JCI121741. Citation Information: J Clin Invest. 2018;128(7):2757-2759. https://doi.org/10.1172/JCI121653. Citation Information: J Clin Invest. 2018;128(7):2760-2762. https://doi.org/10.1172/JCI121526. Interferonopathies are a subset of autoinflammatory disorders with a prominent type I IFN gene signature. Treatment of these patients has been challenging, given the lack of response to common autoinflammatory therapeutics including IL-1 and TNF blockade. JAK inhibitors (Jakinibs) are a family of small-molecule inhibitors that target the JAK/STAT signaling pathway and have shown clinical efficacy, with FDA and European Medicines Agency (EMA) approval for arthritic and myeloproliferative syndromes. Sanchez and colleagues repurposed baricitinib to establish a significant role for JAK inhibition as a novel therapy for patients with interferonopathies, demonstrating the power of translational rare disease research with lifesaving effects. Citation Information: J Clin Invest. 2018;128(7):2787-2801. https://doi.org/10.1172/JCI95407. Citation Information: J Clin Invest. 2018;128(7):2819-2832. https://doi.org/10.1172/JCI99321. Adverse drug reactions (ADRs) are a major obstacle to drug development, and some of these, including hypersensitivity reactions to the HIV reverse transcriptase inhibitor abacavir (ABC), are associated with HLA alleles, particularly HLA-B*57:01. However, not all HLA-B*57:01+ patients develop ADRs, suggesting that in addition to the HLA genetic risk, other factors may influence the outcome of the response to the drug. To study HLA-linked ADRs in vivo, we generated HLA-B*57:01–Tg mice and show that, although ABC activated Tg mouse CD8+ T cells in vitro in a HLA-B*57:01–dependent manner, the drug was tolerated in vivo. In immunocompetent Tg animals, ABC induced CD8+ T cells with an anergy-like phenotype that did not lead to ADRs. In contrast, in vivo depletion of CD4+ T cells prior to ABC administration enhanced DC maturation to induce systemic ABC-reactive CD8+ T cells with an effector-like and skin-homing phenotype along with CD8+ infiltration and inflammation in drug-sensitized skin. B7 costimulatory molecule blockade prevented CD8+ T cell activation. These Tg mice provide a model for ABC tolerance and for the generation of HLA-B*57:01–restricted, ABC-reactive CD8+ T cells dependent on both HLA genetic risk and immunoregulatory host factors. Citation Information: J Clin Invest. 2018;128(7):2848-2861. https://doi.org/10.1172/JCI99424. Neurofibromatosis type 1 associates with multiple neoplasms, and the Schwann cell tumor neurofibroma is the most prevalent. A hallmark feature of neurofibroma is mast cell infiltration, which is recruited by chemoattractant stem cell factor (SCF) and has been suggested to sustain neurofibroma tumorigenesis. In the present study, we use new, genetically engineered Scf mice to decipher the contributions of tumor-derived SCF and mast cells to neurofibroma development. We demonstrate that mast cell infiltration is dependent on SCF from tumor Schwann cells. However, removal of mast cells by depleting the main SCF source only slightly affects neurofibroma progression. Other inflammation signatures show that all neurofibromas are associated with high levels of macrophages regardless of Scf status. These findings suggest an active inflammation in neurofibromas and partly explain why mast cell removal alone is not sufficient to relieve tumor burden in this experimental neurofibroma model. Furthermore, we show that plexiform neurofibromas are highly associated with injury-prone spinal nerves that are close to flexible vertebras. In summary, our study details the role of inflammation in neurofibromagenesis. Our data indicate that prevention of inflammation and possibly also nerve injury at the observed tumor locations are therapeutic approaches for neurofibroma prophylaxis and that such treatment should be explored. Citation Information: J Clin Invest. 2018;128(7):2862-2876. https://doi.org/10.1172/JCI98968. Citation Information: J Clin Invest. 2018;128(7):2877-2893. https://doi.org/10.1172/JCI98765. Drug resistance remains the key problem in cancer treatment. It is now accepted that each myeloma patient harbors multiple subclones and subclone dominance may change over time. The coexistence of multiple subclones with high or low chromosomal instability (CIN) signature causes heterogeneity and drug resistance with consequent disease relapse. In this study, using a tandem affinity purification–mass spectrometry (TAP-MS) technique, we found that NEK2, a CIN gene, was bound to the deubiquitinase USP7. Binding to USP7 prevented NEK2 ubiquitination resulting in NEK2 stabilization. Increased NEK2 kinase levels activated the canonical NF-κB signaling pathway through the PP1α/AKT axis. Newly diagnosed myeloma patients with activated NF-κB signaling through increased NEK2 activity had poorer event-free and overall survivals based on multiple independent clinical cohorts. We also found that NEK2 activated heparanase, a secreted enzyme, responsible for bone destruction in an NF-κB–dependent manner. Intriguingly, both NEK2 and USP7 inhibitors showed great efficacy in inhibiting myeloma cell growth and overcoming NEK2-induced and -acquired drug resistance in xenograft myeloma mouse models. Citation Information: J Clin Invest. 2018;128(7):2914-2926. https://doi.org/10.1172/JCI99366. Complications of diabetes affect tissues throughout the body, including the central nervous system. Epidemiological studies show that diabetic patients have an increased risk of depression, anxiety, age-related cognitive decline, and Alzheimer’s disease. Mice lacking insulin receptor (IR) in the brain or on hypothalamic neurons display an array of metabolic abnormalities; however, the role of insulin action on astrocytes and neurobehaviors remains less well studied. Here, we demonstrate that astrocytes are a direct insulin target in the brain and that knockout of IR on astrocytes causes increased anxiety- and depressive-like behaviors in mice. This can be reproduced in part by deletion of IR on astrocytes in the nucleus accumbens. At a molecular level, loss of insulin signaling in astrocytes impaired tyrosine phosphorylation of Munc18c. This led to decreased exocytosis of ATP from astrocytes, resulting in decreased purinergic signaling on dopaminergic neurons. These reductions contributed to decreased dopamine release from brain slices. Central administration of ATP analogs could reverse depressive-like behaviors in mice with astrocyte IR knockout. Thus, astrocytic insulin signaling plays an important role in dopaminergic signaling, providing a potential mechanism by which astrocytic insulin action may contribute to increased rates of depression in people with diabetes, obesity, and other insulin-resistant states. Citation Information: J Clin Invest. 2018;128(7):2951-2965. https://doi.org/10.1172/JCI98727. A synthetic lethality–based strategy has been developed to identify therapeutic targets in cancer harboring tumor-suppressor gene mutations, as exemplified by the effectiveness of poly ADP-ribose polymerase (PARP) inhibitors in BRCA1/2-mutated tumors. However, many synthetic lethal interactors are less reliable due to the fact that such genes usually do not perform fundamental or indispensable functions in the cell. Here, we developed an approach to identifying the “essential lethality” arising from these mutated/deleted essential genes, which are largely tolerated in cancer cells due to genetic redundancy. We uncovered the cohesion subunit SA1 as a putative synthetic-essential target in cancers carrying inactivating mutations of its paralog, SA2. In SA2-deficient Ewing sarcoma and bladder cancer, further depletion of SA1 profoundly and specifically suppressed cancer cell proliferation, survival, and tumorigenic potential. Mechanistically, inhibition of SA1 in the SA2-mutated cells led to premature chromatid separation, dramatic extension of mitotic duration, and consequently, lethal failure of cell division. More importantly, depletion of SA1 rendered those SA2-mutated cells more susceptible to DNA damage, especially double-strand breaks (DSBs), due to reduced functionality of DNA repair. Furthermore, inhibition of SA1 sensitized the SA2-deficient cancer cells to PARP inhibitors in vitro and in vivo, providing a potential therapeutic strategy for patients with SA2-deficient tumors. Citation Information: J Clin Invest. 2018;128(7):2966-2978. https://doi.org/10.1172/JCI98219. Citation Information: J Clin Invest. 2018;128(7):2979-2995. https://doi.org/10.1172/JCI96769. Citation Information: J Clin Invest. 2018;128(7):2996-3007. https://doi.org/10.1172/JCI95993. Citation Information: J Clin Invest. 2018;128(7):3024-3040. https://doi.org/10.1172/JCI96477. Citation Information: J Clin Invest. 2018;128(7):3129-3143. https://doi.org/10.1172/JCI96060. Citation Information: J Clin Invest. 2018;128(7):3144-3159. https://doi.org/10.1172/JCI97736. Citation Information: J Clin Invest. 2018;128(7):3160-3170. https://doi.org/10.1172/JCI97854. Citation Information: J Clin Invest. 2018;128(7):3198-3198. https://doi.org/10.1172/JCI122740. Citation Information: J Clin Invest. 2018;128(7):3199-3199. https://doi.org/10.1172/JCI122301.